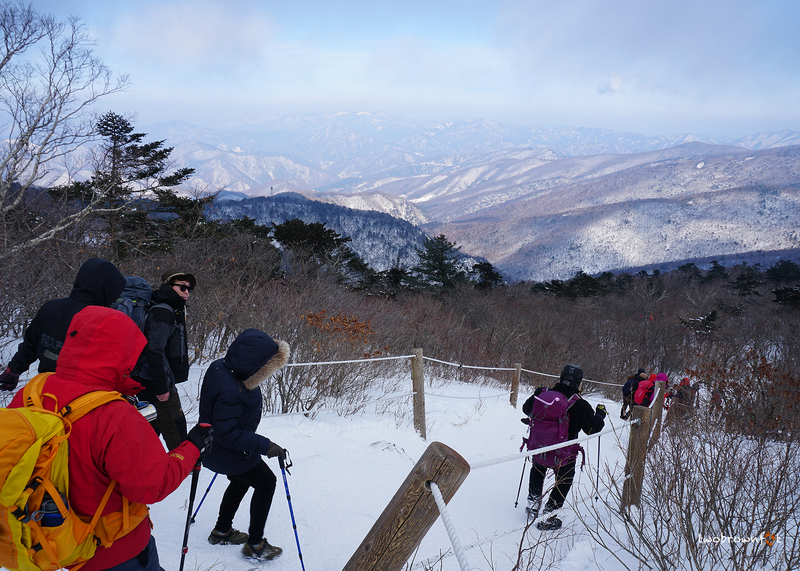 In January, Gangwan-do province is a hub for snow festivals, skiing, and ice fishing. 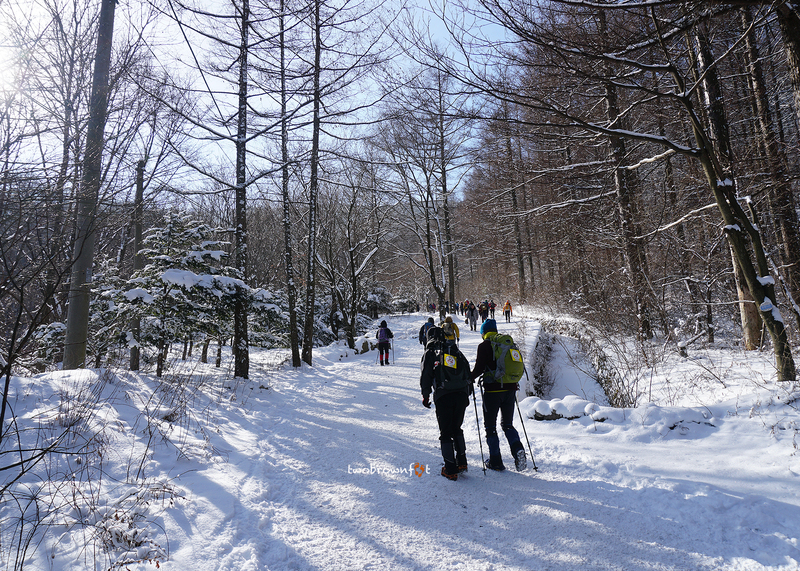 Taebaeksan National Park hosts an annual Snow Festival, in the second week of January, when temperatures dip to an all-time low. 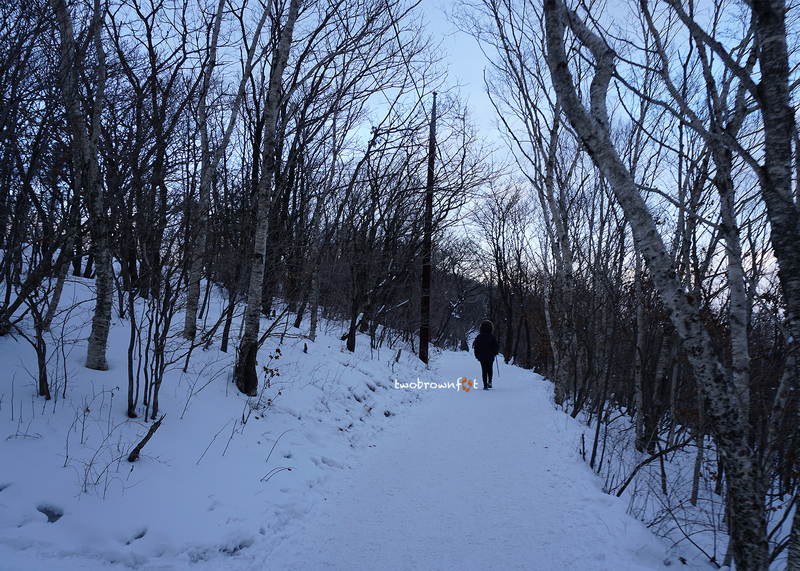 Taebaeksan is also popular for its sunrise view hike. I generally avoid festivals and tourism events. But, I felt the need to escape Seoul, city life, and the dull winter days. We woke up at 4 AM in the morning, and within an hour, took a cab to Dong Seoul Bus Terminal. We had made an online reservation for the bus to Taebaek city on the previous day. We left Seoul at 6:30 AM and 3 hours later, we reached Taebaek Intercity Bus Terminal. There’s a local tourism information centre here and I’d suggest: this should be your starting point. 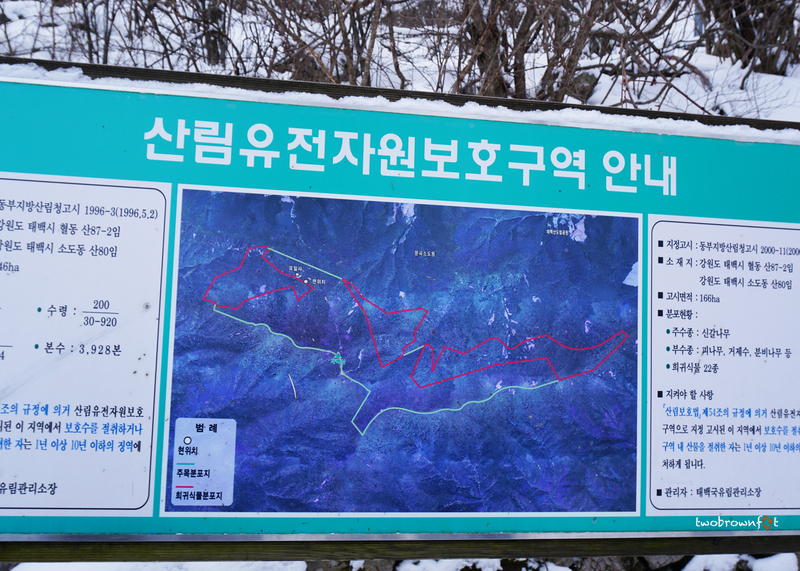 We picked up a map of Taebaek region (with the hiking course) and the timetable for the local bus to the mountain. We were advised to take the Yuilsa Temple route, popular for its scenic views and solitude. 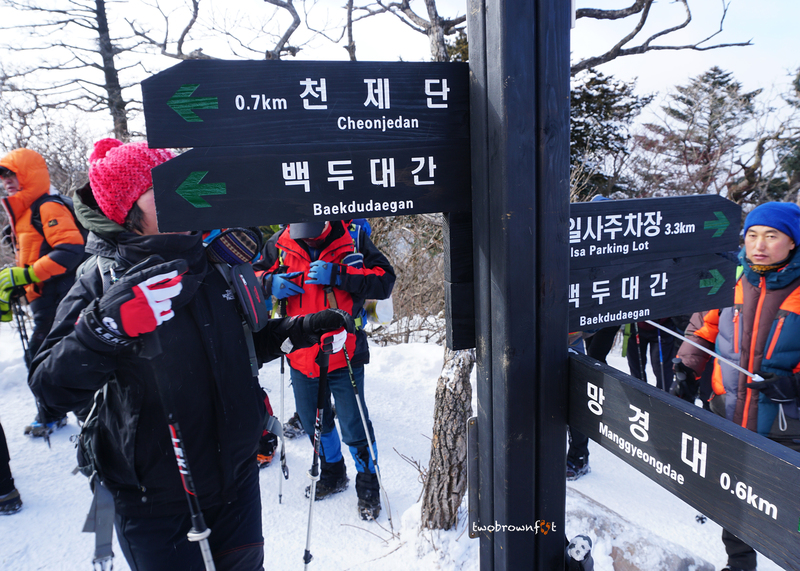 Although the trail is easy, during winter, you need to wear crampons and carry hiking poles. We bought crampons from a local store and took a cab directly (instead of waiting for the bus) to the Yuilsa Temple Ticket Booth. It was a nightmare at the entrance of the trail. 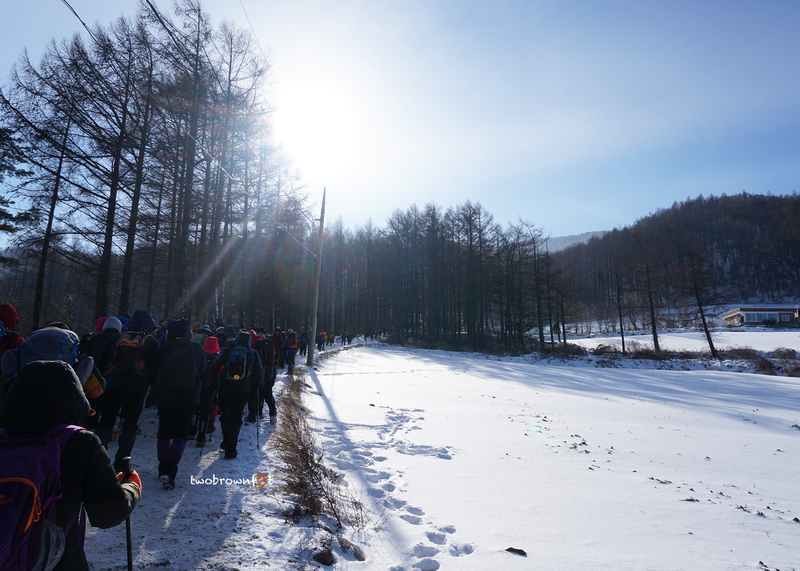 Busloads of Korean hikers and hiking groups were buzzing around. It was chaos mixed with optimism. I realised it was a mistake to hike during the festival and the tourism guide had probably given us bad advice. It was already past 10 AM when we started hiking. The trail begins with a gentle slope — taking you through a path — that cuts through the forest. 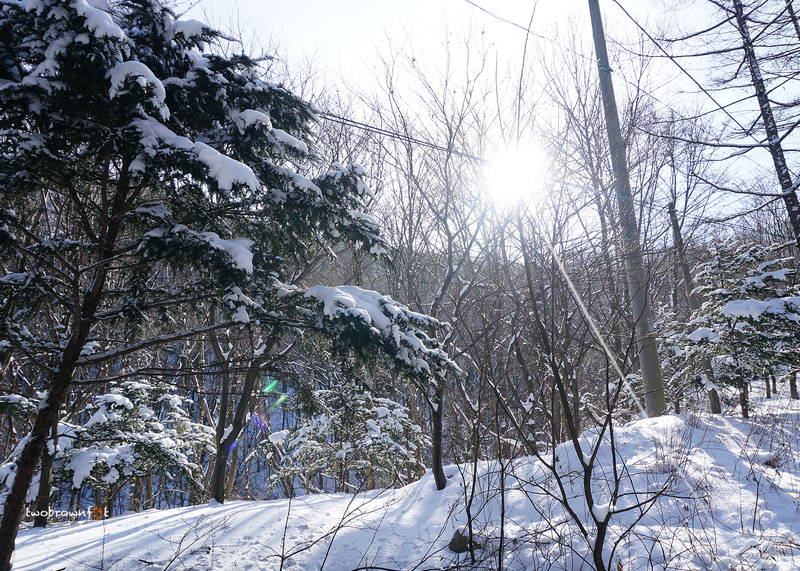 On either side, trees were covered under snow and sunlight pierced through branches. Climbing slowly helped escape crowds of hikers around us. After 15 minutes, we reached our first signboard. Some hikers chose to cut across, climbing the steep hill at the intersection. We chose to keep to the trail and follow the arrow leading to Yuilsa Temple. Ironically, we never saw the temple at all. The trail gets easier to walk after this. It’s a well marked path, curving around at regular intervals, and gradually rising up. 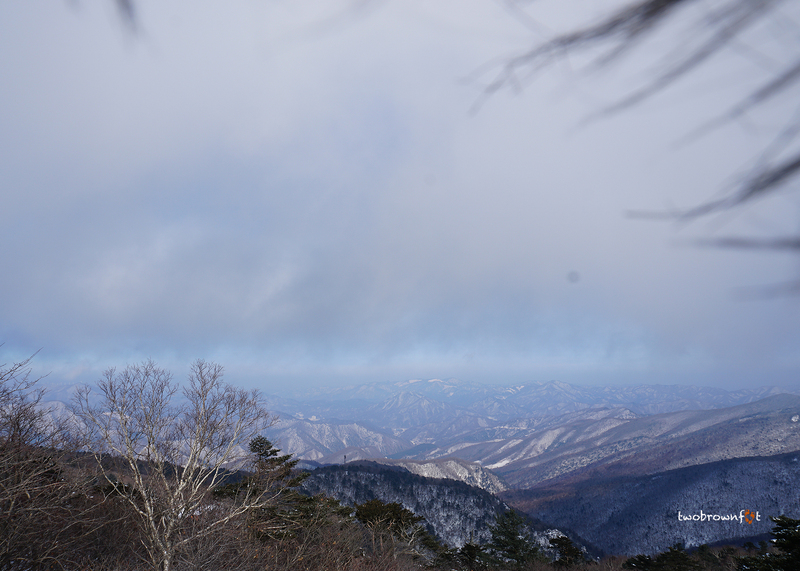 At the edge, we could see the mountain ranges in the distance. The trees are the highlight of this hike and give a stiff competition to the mountains. Walking with so many hikers felt like a pilgrimage of sorts. 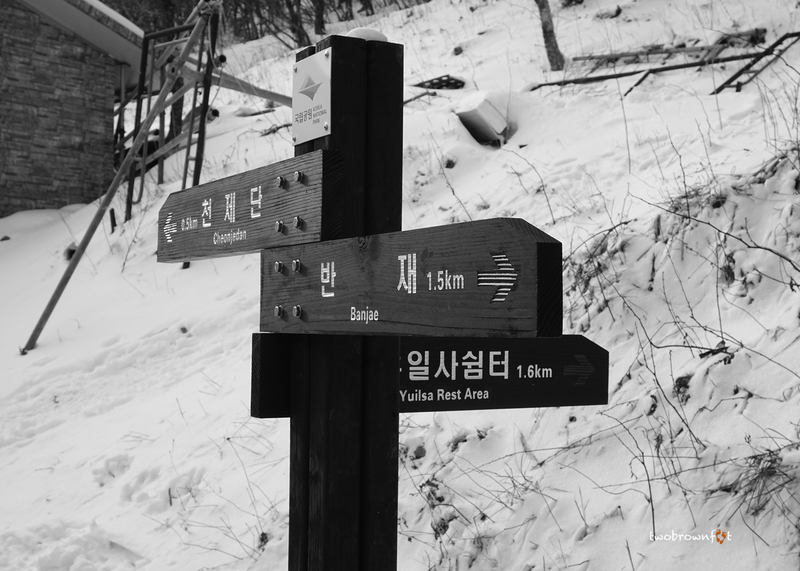 And from what I understand, this is a kind of pilgrimage: to explore and appreciate the natural beauty of the Korean mountains. Basil and I found it hard to stay together. Occasionally, we lost sight of each other and once, didn’t even know where the other was. The crowds didn’t seem to wane. So far, there wasn’t any pushing and people seemed to be strangely calm and happy. At this point, we took another another break, to eat oranges (like locals) and enjoy the view. We saw a description board (above) and didn’t feel the need to translate it. In hindsight, it was a bad idea. 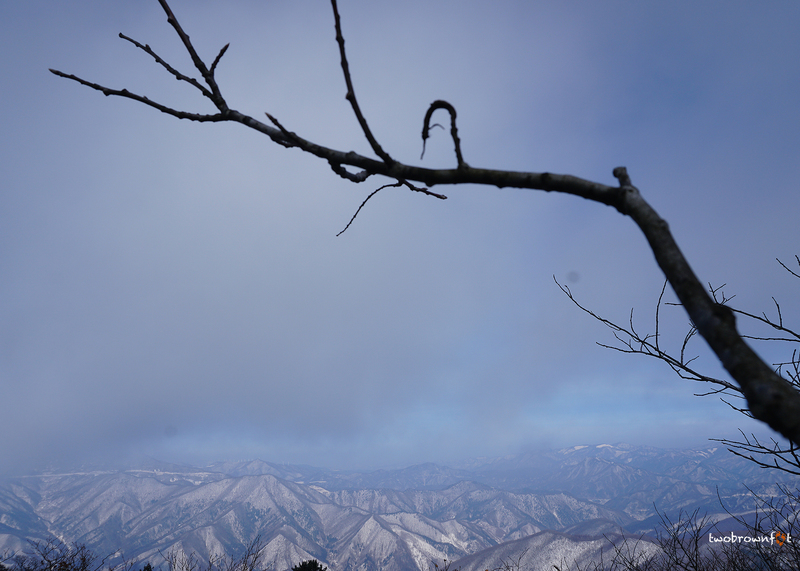 There were no other signboards until the summit. It was post noon and we should have had the sandwiches we had brought along; but Basil thought of eating lunch closer to the top. 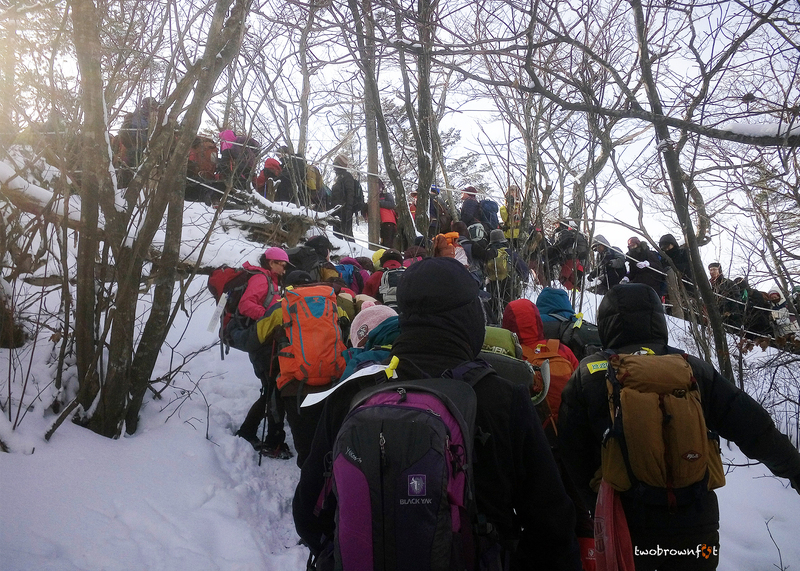 We climbed further and around the curve — there was chaos. The next leg of the trail was a series of frozen stairs that passed through a cabin. Hikers thronged the gates and there was some yelling. Some hikers broke the line and tried joining the stairway — from the steep side of the mountain. It was the first time I panicked. What’s more, I had to face another fear and climb the steep side of the mountain, that cut across to the stairs. As we reached the stairway, we had to duck under ropes and join other hikers. It was each for himself or herself. I expected the hiker, in front of me, to hold the ropes, so that I didn’t slip before getting to the other side. And because he didn’t care who’s next, I had to do it on my own. Basil followed and I ensured he held up the ropes for the next hiker. We can make small changes, even if, people don’t do the same for us. After 20 minutes of being pushed and trying to avoid bumping into other hikers (on the down trail); we reached a rest stop. So far, there was no place to sit or any signboard. It was getting colder and I didn’t think I could go any further. Another hiker said it would take 30 minutes to the top. And I had a meltdown of sorts. After eating something, my brain felt a little better and we continued climbing. I was happy to see the stunted tree growth (similar to Hallasan) indicating we were near the ridge of the mountain. 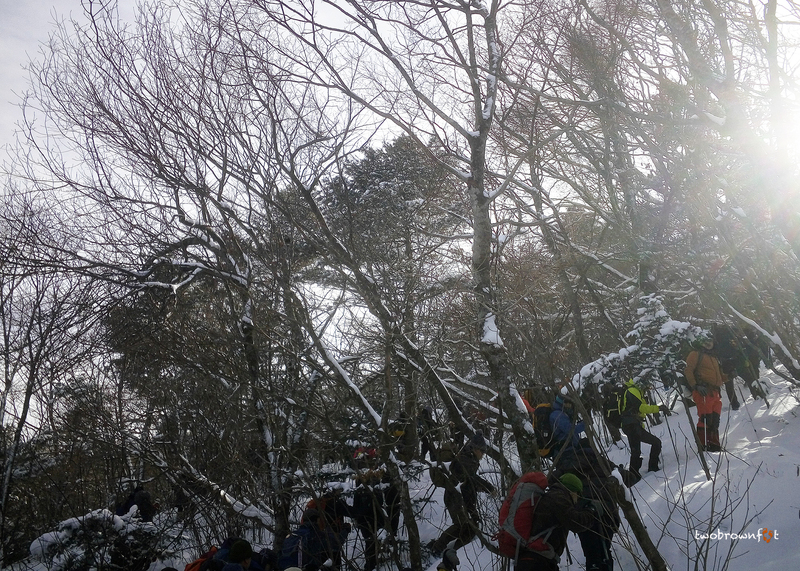 Hikers formed groups, covered in plastic, and ate their meal. I found a branch, to sit, and have the rest of my sandwich, whilst trying to move my numb toes. 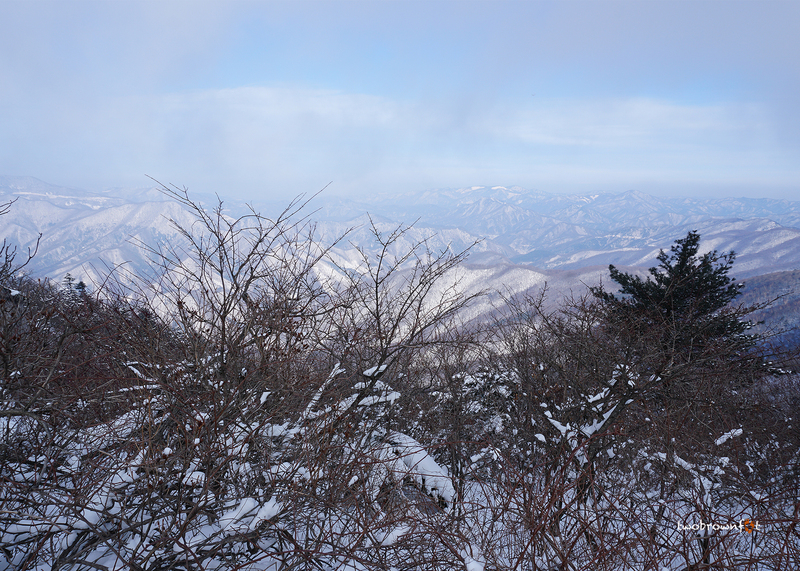 We finally reached the top and the ceremonial (Cheonjedan) altar was not far from here. The mountain view — made the effort of wading through the crowd — worth it. 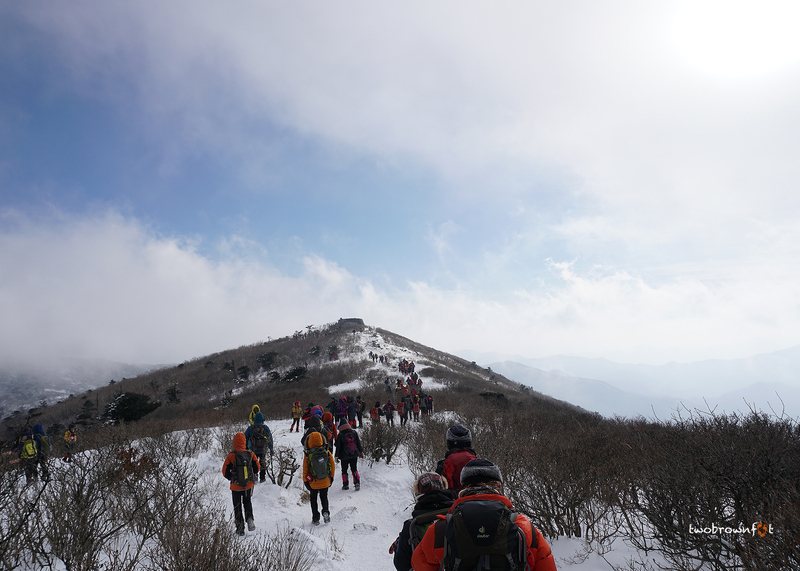 I guess, this must be Janggunbong Peak (1568 m) because everyone wanted to click a picture with the mountains. It’s ironic, no-one wanted to observe the beauty in silence. 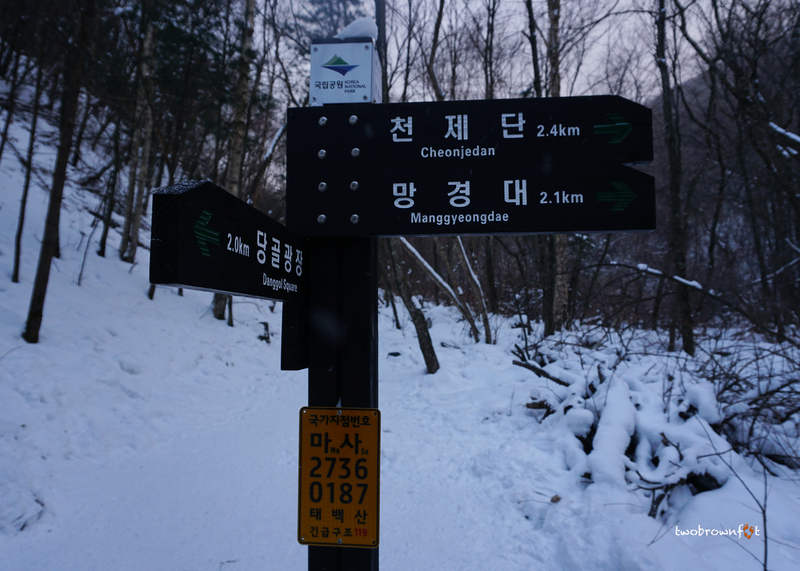 Finally, we saw a signboard, and it was comforting to know we were on trail. The mountains kept looking better and were covered beneath a sheath of fog. We finally made it to the top — twenty minutes later. The wind was really strong here and we couldn’t stay for very long. 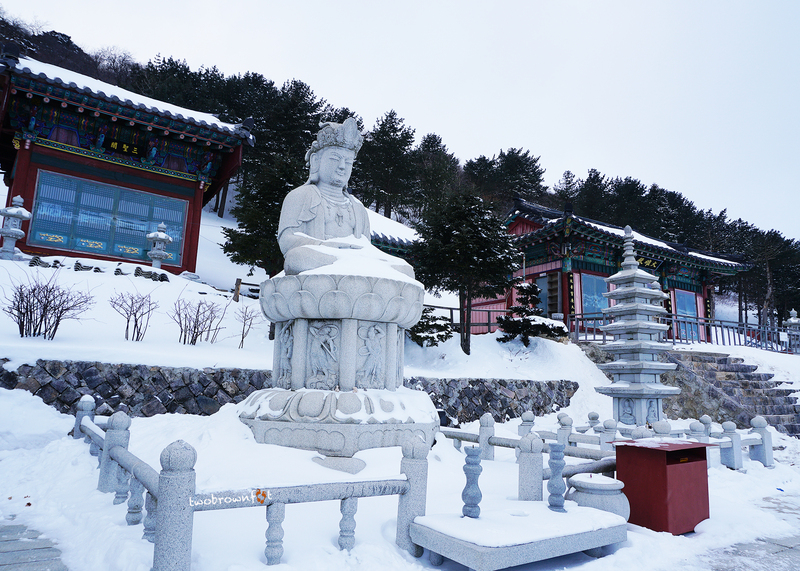 Cheonjedan, a group of ancient ceremonial altars, was used to venerate the heavens. Standing here, in the midst of clouds and mountains, it wasn’t hard to understand why. Janggundan Altar (above) is about 300 m north from the next altar (below). A pathway connects the first altar from the second and involves walking along the exposed ridge of the mountain. It was scary with the wind blowing and the fog covering the trail. 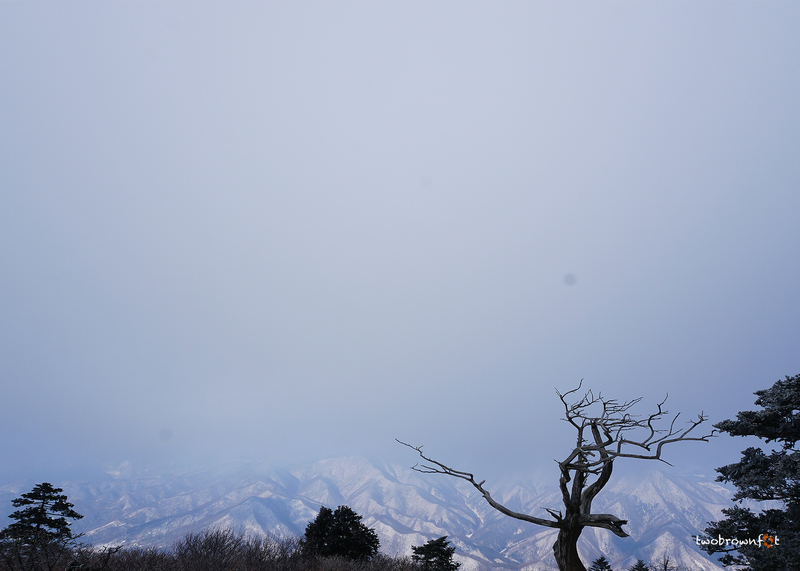 We had a brief moment of blue sky and that gave me a little courage to continue further. The walk on the ridge wasn’t as scary as it looked. Cheonwangdan altar was equally spectacular. We didn’t stay for long and started our descent via Manggyeong Temple. It was probably 2 PM when we started descending. Initially, it was very slippery with a lot of sliding. Once you get used to it; it’s really fast to go down. 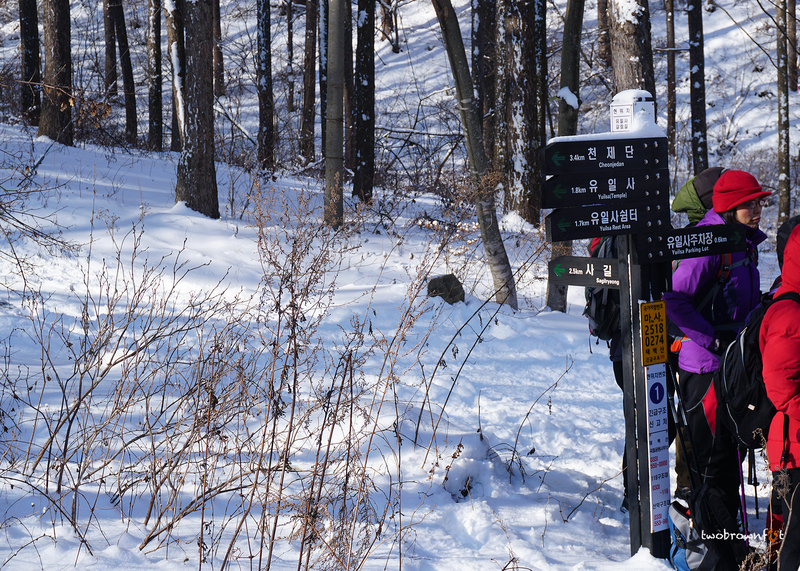 Unlike the other trail, there are restrooms here and even a small counter for hot tea or noodles. This trail is a lot more easier (passes through the forest) and is preferable for families with young kids. Manggyeong Temple is the only temple we saw during the hike. Chants playing, in the background, were carried away by the wind across the lofty mountain tops. We took a break to enjoy the solitude of the mountains. The trail goes deeper into the forest and is very similar to the trail we had taken in Hallasan. After 40 minutes of walking, we saw a rest area, and it was the first time, I sat properly, after nearly 4 hours of hiking in the snow. 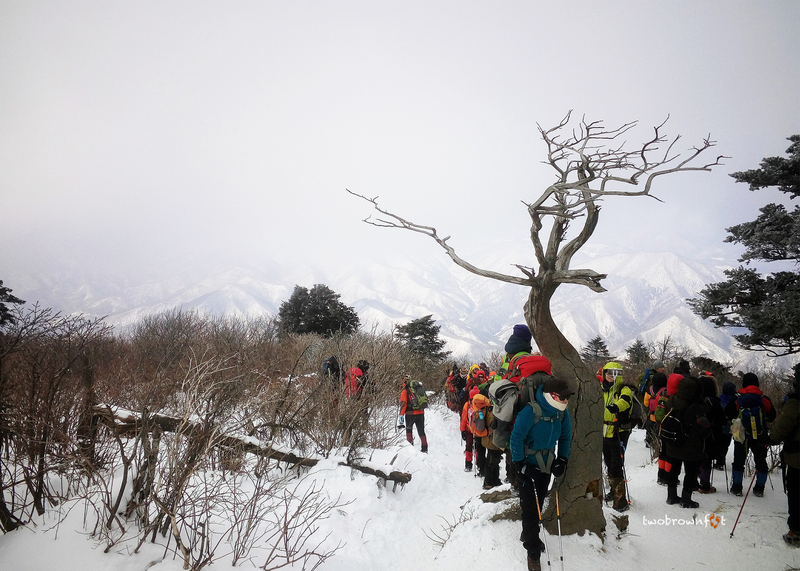 A hiker offered us sweetened fruits and a Korean sweet. And I forgot the selfishness that I had seen on the other trail. Another hiker popped a sweet in my mouth while I was struggling to descend. And just like that, my faith in humanity was restored. 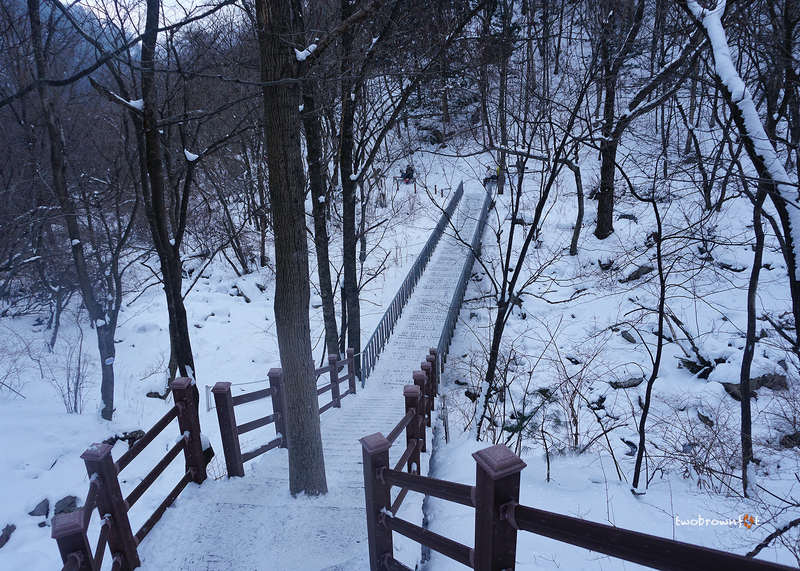 Toward the end, the trail merges into a stairway and crosses a frozen river. We were practically alone here and it started snowing. We finally made it to Danggol Square nearly 2 hours from the top. It was about 5 PM and we had hot (free) coffee at the Ice cafe. We quickly looked at the ice sculptures and took a cab to the Taebaek Intercity Bus Terminal. It took us 3 hours to reach Seoul and we finally reached home at 11 PM. 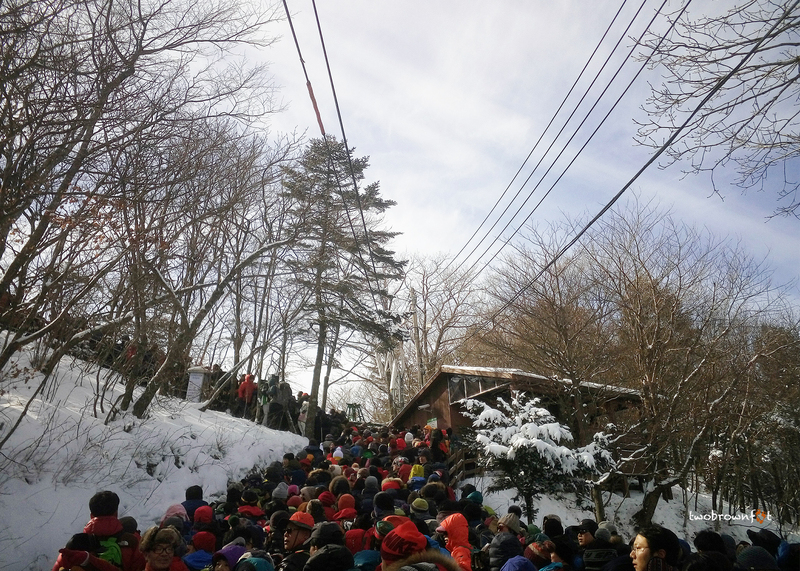 Gosh, the chaotic crowds on the way up looked scary! But you must have been so pleased to complete the whole walk, lovely pictures too…. Thanks a bunch, Vicky! 🙂 It was a little scary initially and I’m not the best with ‘fear’. After the summit it was smooth flowing though. Sounds so stressful with those crowds! Beautiful scenery, though! Wooowwww Cheryl ! This is the kind of adventure that I love! 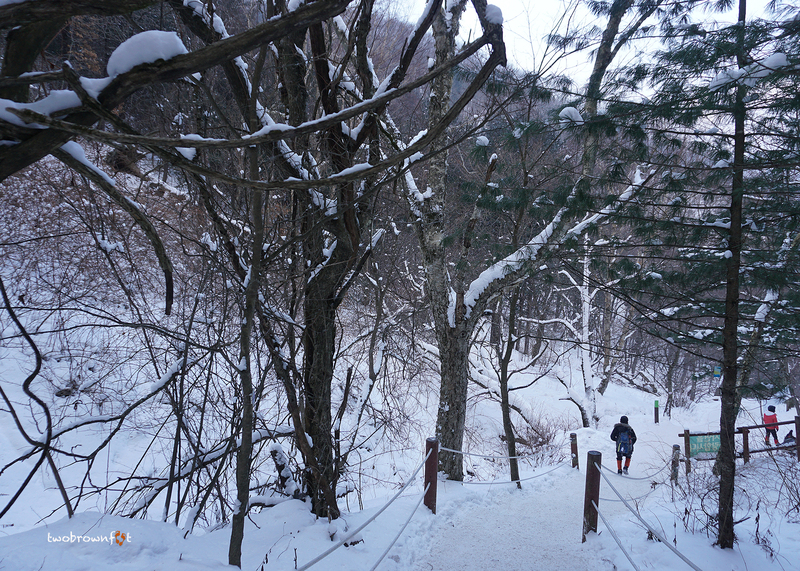 Winter wonderland in Korea is beautiful. I remember my time in the Alps last month, similar like this and that’s the time I was in awe with the beauty and ( goodness) of snow lol. Looks like you had fun..so many people!! 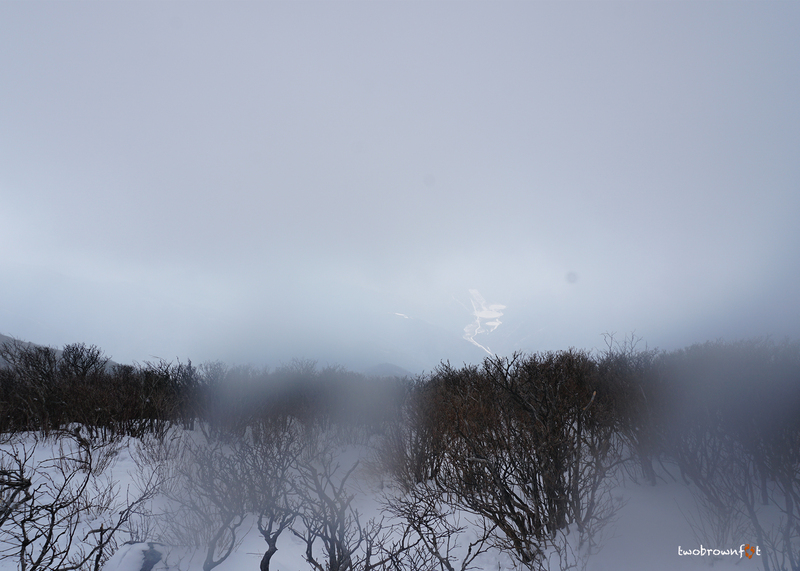 Its always good to experience both worlds…hot and cold, snow, rain & duststorm. I felt like that when we were in Austria last month, I am not so fond of the cold either. But hey, spring is just around the corner. I am already looking forward to warmer days! Haha! Actually, festivals and public holidays turn out like this. So, we generally don’t leave Seoul. But, we felt the need to join the festivities of winter and I’m so glad we did. It is the best way to learn more about the people and all the things local. Thanks, Mabel. We generally carry energy bars and fruits. It’s quite good to regain energy quickly. 🙂 Crowds were crazy, but I’m so glad we did this. What an incredible looking trail. But oh, so crowded. I probably would have opted out….too many people, but no doubt was worth the effort! That looks so beautiful although those crowds definitely don’t look like fun! Wow. 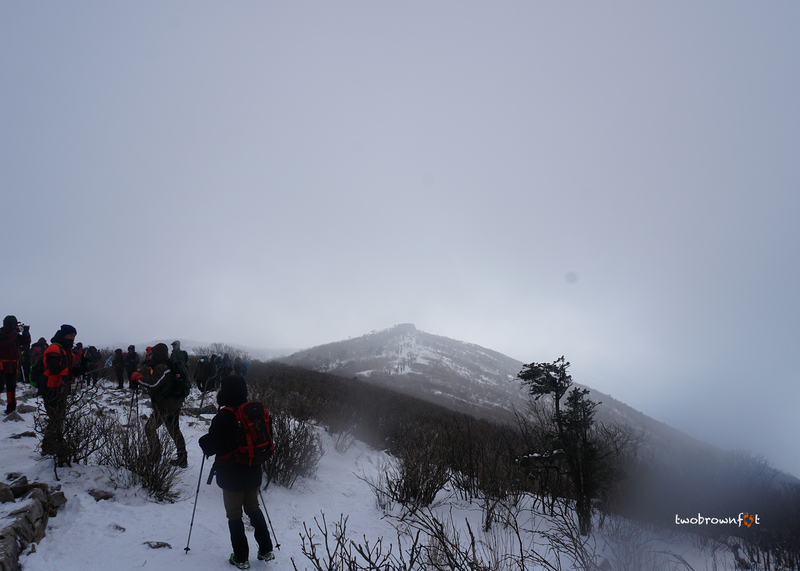 Hiking through the snow, caught in the middle of pushy crowds, and no chance to reach the summit temple you originally planned to visit. Not a typical hike. But I’m glad to see the backside was more relaxing. Oh my goodness, the crowds! Poor you! But that passing hiker popping a sweet in your mouth … that was so touching! Haha! This hike inspired my WPC post on “Drowning out the noise”. 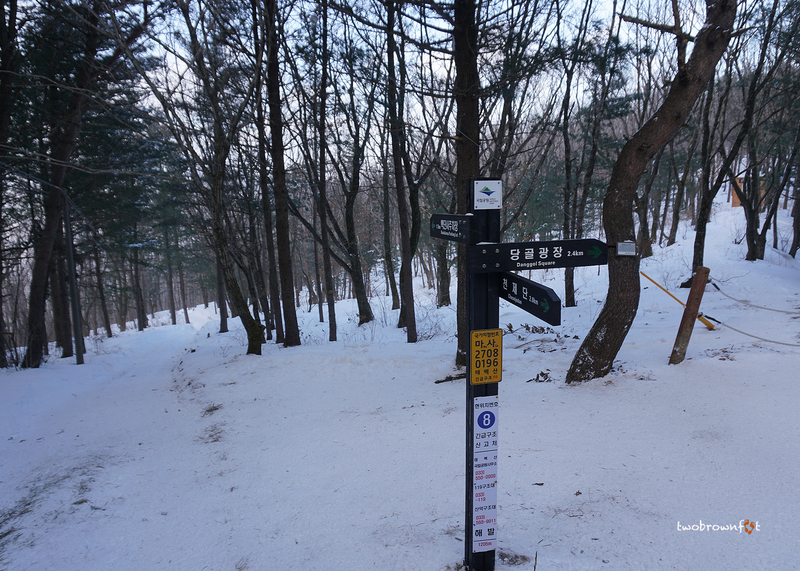 🙂 Korean hikers are generally quite nice and they’re known to share oranges and Korean sweets. 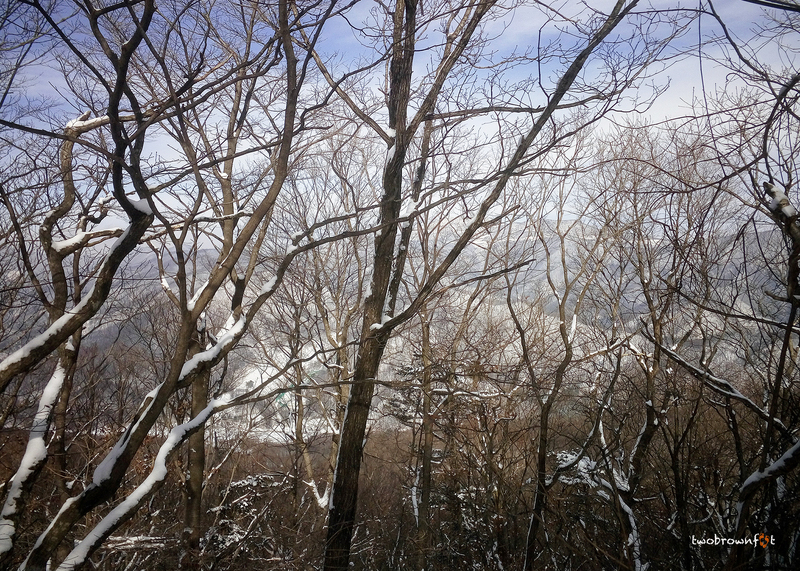 I guess, the snow festival and hiking tours killed the serenity of the mountain. I can understand why it was considered sacred. OMG! What a experience this could have been for you guys. Your writing took me through your journey, fabulous! It was quite a ‘COLD’ ‘toe-numbing’ (literally) experience! Brr! 🙂 So glad you enjoyed reading this post. I did this hike a few years ago too! I couldn’t believe how crowded the trail was. But it was worth it to finally reach the top. Sorry, I just read your comment 😦 It was definitely worth the effort. 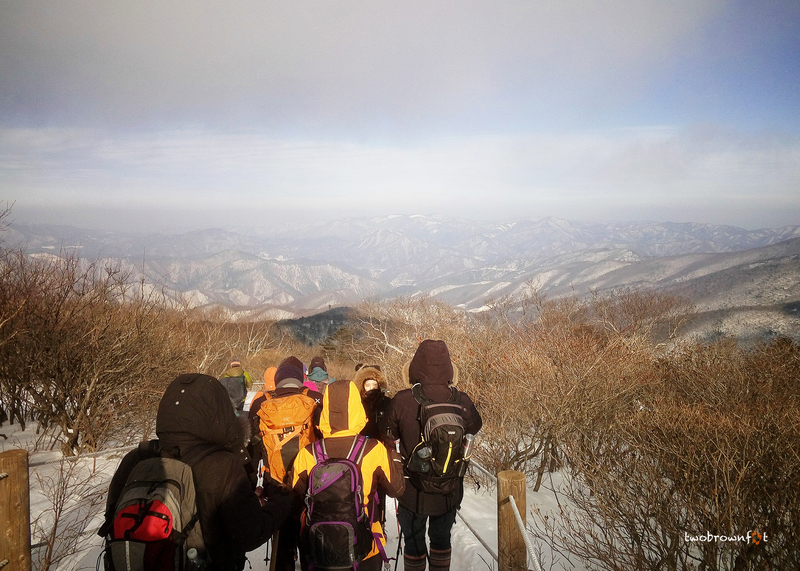 It was also our last hike in Korea. Haven’t hiked since then. Winter seems amazing at this place. I am not a fan of winter, but I can definitely see myself spending a winter holiday there!